The brothers of the community live solely by their work. They do not accept donations. In the same way, they do not accept personal inheritances for themselves; the community gives them to the very poor. Certain brothers live in some of the disadvantaged places in the world, to be witnesses of peace there, alongside people who are suffering. These small groups of brothers, in Asia, Africa and South America, share the living conditions of the people around them. They strive to be a presence of love among the very poor, street children, prisoners, the dying, and those who are wounded by broken relationships, or who have been abandoned. Over the years, young adults have been coming to Taizé in ever greater numbers; they come from every continent to take part in weekly meetings. Sisters of Saint Andrew, an international Catholic community founded seven centuries ago, Polish Ursuline Sisters and Sisters of St Vincent de Paul take on some of the tasks involved in welcoming the young people. 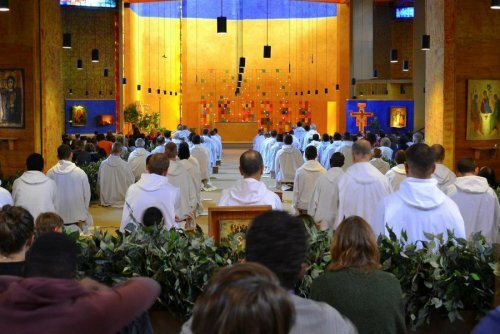 Church leaders also come to Taizé. The community has thus welcomed Pope John Paul II, Ecumenical Patriarch Bartholomew of Constantinople, metropolitans and bishops of different Orthodox Churches, four Archbishops of Canterbury, the fourteen Lutheran bishops of Sweden, and countless pastors from all over the world. From 1962 on, brothers and young people sent by Taizé went back and forth continually to the countries of Eastern Europe, with great discretion, to visit those who were confined within their frontiers. Brother Roger died on 16 August 2005, at the age of 90, killed by a deranged person during the evening prayer. Since then, Brother Alois, whom Brother Roger chose as his successor many years ago, has been the prior of the Community.